In January, I left the beautiful concrete jungles of Europe for a real one. I found my wilderness in Costa Rica’s Osa Peninsula, one of the most remote regions of Central America and the gateway to Corcovado National Park. I began my trip as a volunteer on a turtle project, living in a tent on the beach, 45 minutes by bike from town on a dirt road riddled with potholes. After two weeks of turtle patrol, I left the sea for the mountains where I worked as a volunteer at La Tarde, an ecolodge situated on the buffer zone of Corcovado National Park in what National Geographic calls “one of the most biologically intense places on Earth.” It was there at La Tarde that I met my Costa Rican companion: La Gatilla. La Tarde happens to be home to the most famous cat in the Osa, La Gatilla, an ocelot, which the owner Eduardo, who five years ago turned his finca (farm) into a rustic ecolodge, brought to the property after she was found abandoned in town. The ocelot was adopted by the family dog who raised her, protected her, and taught her to hunt, until the time she began to wander off into the woods alone. We stared into the woods, waiting for the cat to appear. Marcelo called again. Nothing. Then, out of the hollow of a nearby tree trunk, sprang the ocelot. She jumped down from her perch and made a B-line for Marcelo, curling herself around his legs. He bent down to pet her and she bit affectionately at his arm. A moment later and he was wrestling with her. When he stopped, she came to me. I bent down to pet her and she nipped at my arm and set her claw on my chest. I wondered whether she could feel my heart beating. That night, I went home with a pair of scratches, a bite mark, and a red arm that throbbed. But it didn’t matter, because I had been wrestling with an ocelot. I was going to have the best scar story around. Two weeks after that visit, I went back up to La Tarde, this time to stay. I was given a guest tent which had remained unoccupied after the ocelot opened the tent flap and jumped on a guest’s bed. Eduardo warned me about tying the tent string, but I decided against it. 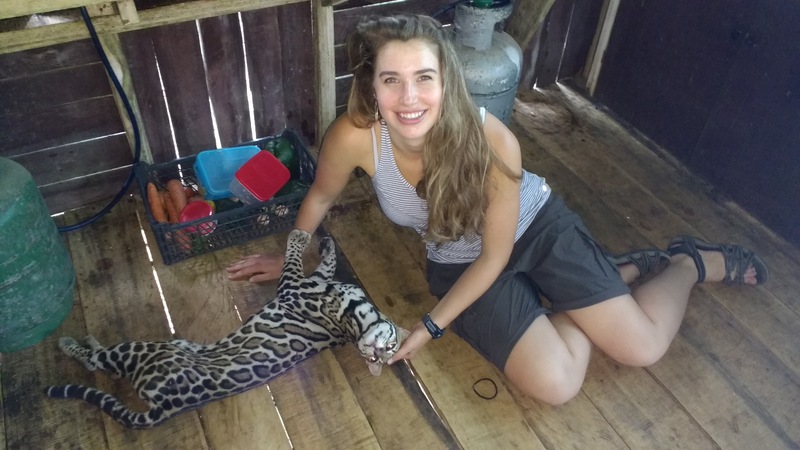 If the ocelot wanted a cuddle buddy, I was happy to oblige. Three nights later, my wish came true. I was fast asleep, when I heard a rustling from outside the tent and the sound of the zipper sliding up. I sat up in bed, Leatherman in hand, awaiting an intruder. In the dim light of the moon, I saw the spotted nose and silky coat of the ocelot. She loped around the tent, the light of the moon on her back. After exploring the tent, she doubled back, sprang up on my bed, and settled herself at the end of my mattress. I watched her lick herself, before I fell back asleep. I woke up the next morning to the croaking calls of the mantled howler monkeys and the light seeping through the screen of my tent. The ocelot was gone. I stretched out, kicked off the sheets, and got out of bed to get water. The sun had just come up over the trees and the ground was still wet with dew. I went to put on my sandals just inside the tent entrace, but they weren’t there. I checked again, this time under the bed. But they were gone. Unworried, I headed across the lawn barefoot to the open-air kitchen. From a distance, I heard the growls of the ocelot and smiled thinking back to her late night appearance. She was in the kitchen, stretched out on the floor, belly up, tossing her head back and forth. As I approached, I saw she had something in her mouth. A moment later, I realized: she had taken my sandals. I ran forward, but I was already to late. One sandal was tossed to the side, completely untouched. The other was in shreds. As I wrestled the shoe out of her mouth, she clawed at my leg, inviting me to play. That night, I kept the tent door open, hoping she’d return. But she never did. She’d already had my sandals. Besides, nighttime was for hunting. In the morning I’d often see her walking around the clearing licking her chops or still eating what she’d killed in the jungle – lizards and rats. She was getting wilder by the day, and becoming less of a companion. I missed my friend, but I knew she was where she belonged.